The western United States is rich in the traditions and heritage of the cowboy. The Cowboy Arts & Gear Museum in Elko, Nevada will showcase the traditions and culture of cowboys. The Spanish Missions were established along the California coast in 1769. Franciscan priests established a system of 21 missions composed of churches, towns, schools and ranches all a day’s ride apart. This was the beginning of ranching in the American west. Ranching became an important industry. Many people were required to guard the herds. These herdsmen were known as Vaqueros. On the ranches, animals multiplied beyond the settler’s expectations. The herds of horses and took well to the climate and the extensive pastures of California region, These Spanish Californios began the origins of cowboys in the American West. Ranches were in rural areas. Those living on ranches adapted to riding horses. Men and women rode to where ever they were going and became excellent riders. 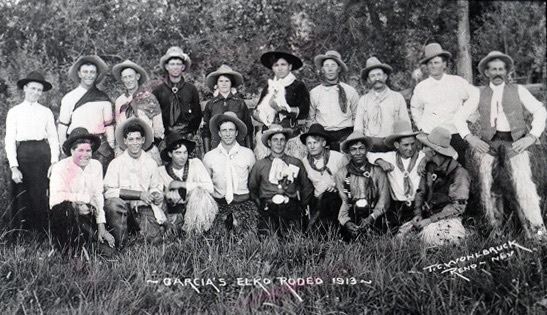 They participated in fiestas, fandangos, rodeos and roundups as the ranch owners and vaqueros often went from ranch to ranch on a large horse bound circuit. Huge round roundups were held to gather the cattle. The hard-riding vaqueros controlled the chaos. They became known for expert horsemanship and roping skills. Ranching and cowboy lifestyles blended as Americans poured into California during and after the 1849 Gold Rush, which increased the demand for beef. Newcomers adapted to the vaquero style. Californios rode ponies that had been trained in a hackamore and swung a big loop with their hand-braided rawhide reatas (ropes). Beginning in the 1870s, ranchers in California began to feel crowded and moved eastward over the Sierra Nevada Mountains into northern Nevada and other regions in the intermountain West. Large ranching empires and small family producers developed. The tradition of the vaquero continued. The vaqueros were now called, “cowboys” or “buckaroos.” The early Mexican techniques for handling cattle remained – and do to this day. On Nevada ranches, buckaroos still carry long ropes, ride slick-fork saddles, and use silver-mounted spade bits and spurs. Informal contests arose between cowboys seeking to test their cattle and horse-handling skills competition against one another, and thus, from the necessary tasks of the working cowboy, the sport of rodeo developed. These cowboys found work on ranches in Nevada and elsewhere. Ranches were thousands of acres in size with thousands of cattle, horses, and sheep requiring care and management. The same practices were used as in past generations. 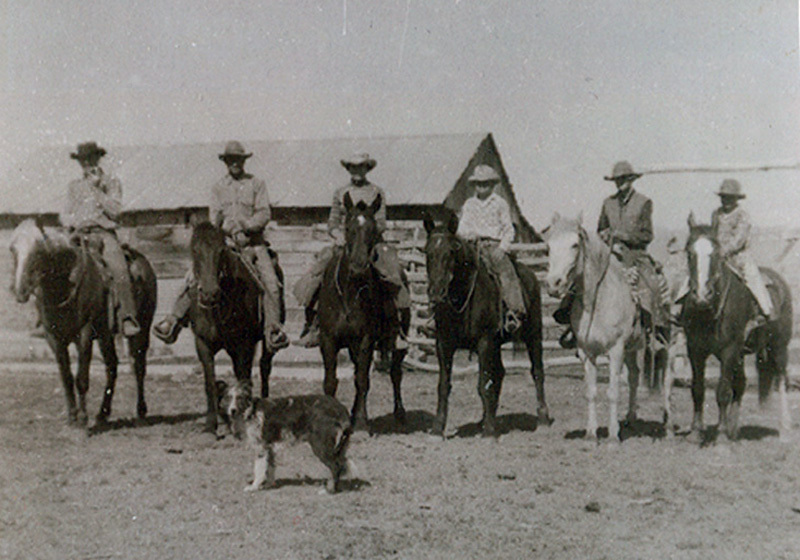 Ranches became multigenerational family owned outfits. Heritage, traditions and continued perseverance of past cultures tied to the land continued with a fierce tenacity. A unique opportunity has become available in northeastern Elko, Nevada where ranching traditions have been firmly in place since the town’s beginning in 1868. In 1894, a young saddle maker and his wife, G.S. and Sauternina Garcia arrived in Elko, Nevada from Santa Margarita, California. Elko was a town on the Central Pacific Railroad. The area was a business and social center for area with ranchers and mining boom towns. His high quality work quickly became sought after by cowboys throughout northern Nevada. By 1897, he produced a mail order catalogue. This proved highly popular as orders poured in from many other areas of the United States. 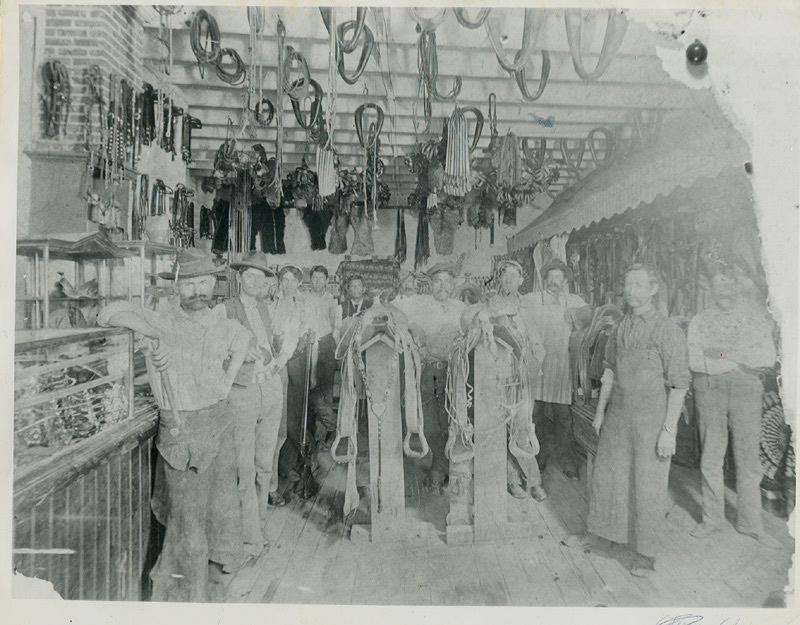 Additional workers were hired as leather crafters and silver craftsmen (and woman). In 1904, G.S. decided to enter a saddle at the St. Louis World’s Fair. As he brought his goods in for display and sale, some leather craftsmen saw the high quality of his work and quietly packed their goods and went home. Garcia’s saddle, decorated with precious gems and intricate silverwork, won a gold medal. The next year in 1905, the same saddle won another gold medal on the west coast in Portland, Oregon. The G.S. Garcia Saddle shop to high soared to high regard acclaim in the ranching world. Garcia goods were highly prized items. Cowboys were willing to pay two years wages and to wait their turn on a two year waiting list to purchase and own one of Garcia’s saddles. A two story wooden frame building with brick pressed tin siding was built at 520 Commercial Street in Elko. A sales shop was on the ground floor and leather and silver crafters worked upstairs, producing high quality products ranging from wallets to buckaroo bedrolls and tents chaps to the world famous saddles. 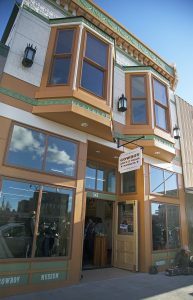 The shop became a community center in downtown Elko at 542 Commercial Street. Ranchers, miners and local businessmen gathered there, conducting business and visiting in the center of town. Two Garcia sons, Les and Henry, joined the family business. A 2,000 seat rodeo grounds on the southern end of town was built in 1912. Well known rodeo performers from throughout the west came to Garcia’s Rodeo. Business thrived. G.S.Garcia died in1933. His sons, Les and Henry continued the highly respected business. However, in 1935, the Garcia sons decided to return the family business to California in Salinas. The two story wooden frame building was purchased in the 1930s by the Elko Lamoille Power Company. For the next 77 years this was the business and operations offices through the various names of the utility company in Elko until the spring of 2016 when present owners, NV Energy built a more modern facility in town. A unique opportunity has arisen as a result of this move. 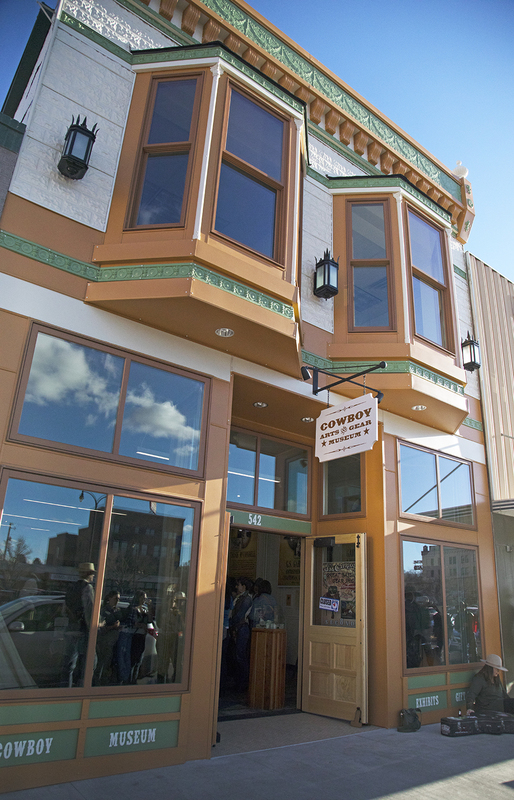 The Garcia Saddle Shop building at 542 Commercial Street has become available through donation to become a non-profit Cowboy Arts & Gear Museum. Guardians of the western tradition – preserving the heritage and craftsmanship of the cowboy of the American West. The interior front of the building has been recreated as Garcia’s shop with antique saddles, bridles, harnesses and other cowboy gear. 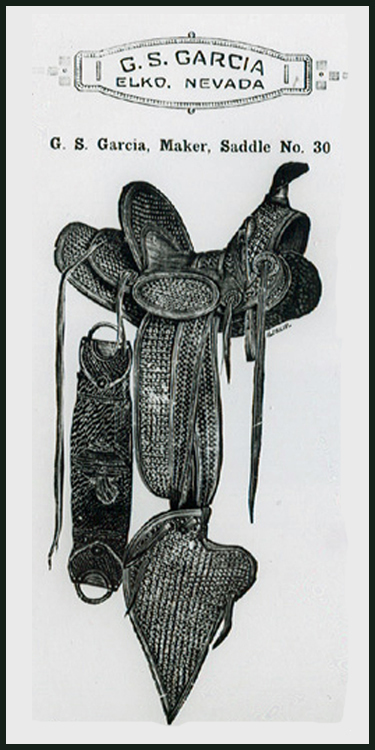 Garcia leather and silver work is highly prized as collectible western memorabilia. Many items have been promised from private collections as gifts and loans to be placed on display. Other exhibits will show how a saddle is constructed and the specialized use of gear. A buckaroo tent, bedroll and other camp gear will be set up. A donation box will be placed in the exhibit area to help with museum operation costs. Future plans for the Second Floor of the original G.S. Garcia building are to occupy the three offices on the second floor. We plan to have them rented to other local non profits at a reasonable rate for income purposes to the Cowboy Arts and Gear Museum. An additional income source will be a gift shop located on the ground floor next to the historic saddle shop exhibit. The store will feature Made in Nevada items-unique and made in Nevada. We will work closely and collaborate with the Western Folklife Center – our neighbor directly across the street from the Cowboy Arts & Gear Museum. This is a perfect partnership as the Western Folklife Center (Home of the National Cowboy Poetry Gathering) focuses on contemporary cowboy lifestyles. The Cowboy Arts & Gear Museum will focus on historic traditions, offering leather stamping classes and workshops, silver engraving demonstrations, and rawhide braiding classes. The opening of the Cowboy Arts and Gear Museum will enable the three other museums in the area – Northeastern Nevada Museum, Western Folklife Center and California Trail Interpretive Center to work collaboratively with each other to create a community of culture and history. We will also work with the Elko Convention and Visitors Authority and Nevada and partner with other cultural institutions locally and throughout the area and across Nevada to attract tourists to visit and experience our area. As part of continuing and encouraging traditional cowboy arts and craftsmanship, the Cowboy Arts and Gear Museum will work with the Traditional Cowboy Arts Association. Their mission is dedicated to preserving and promoting the skills of saddlemaking, bit and spur making, silversmithing and rawhide braiding and the role of these traditional crafts in the cowboy culture of the North American West. This organization would a perfect partner for future programs. Local schools will be able to participate in activities sponsored by the Cowboy Arts and Gear Museum. We will partner with rural ranches and provide an educational program that teaches ranching skills, ranch life and “the cowboy way.” We seek to provide students a hands on experience and see live ranch animals, learn about feeding the various animals from chickens to horses, fun on a ranch, teach about various pieces of tack the cowboys use and other ways of ranch life. There are possibilities to partner with the Nevada Folklife Apprenticeship Program to host master artists to those novices who show an interest and passion in learning traditional cowboy arts. Many native tribes became cowboys as they began to live on reservations. As Indian lifestyles changed from nomadic hunter/gatherer to reservation ranching life, many became cowboys, working for area ranches. Individual styles and craftsmanship developed. We will work with local tribes, Shoshone and Paiute, to continue their unique leatherworking craftsmanship as well as hosting workshops to continue their traditional ways of beading, hide tanning and basketmaking. The Elko County Art Club is also a possible partner (and one block away) to offer classes in the fine arts – oils, watercolor and acrylics. Frederic Remmington and Charles Russell got their start as cowboy artists! Other cultures, local and regional, will be considered and included as collaborative partners – Mexican charros, Basques in the ranching communities, historic evolvement of cowboy traditions and rodeos. This is an opportunity to showcase the rich heritage, culture and traditions of ranching and cowboy lifestyles through exhibits and programs at the Cowboy Arts & Gear Museum in Elko, Nevada.